In the residence Roc de Peclet 1, the apartment offers a wonderful view of the ski area and Caron. The departure of the slopes is directly down the residence, without steps or transport. Same for the return, a track leads you to the foot of the residence. 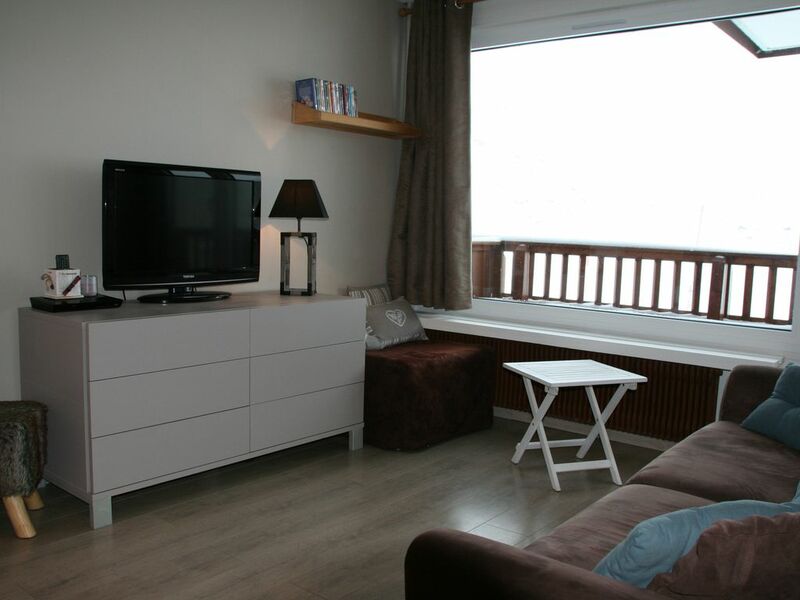 The residence is located near the kindergarten and the ski school, 200 m from shops and restaurants. The apartment was completely renovated in 2011: 2 bedrooms, kitchen, household appliances, paint, flooring, tiles, walls, baths and toilet with shower 120 x 80, dry towel. WIFI: 3 possibilities: 1) The wifi Val Thorens passes in the apartment, it will register at the tourist office to get a code to the week (about 20 €). 2) If you have a SFR box, there is a hotspot that allows you to log in with your personal identifiers without going through the tourist office. 3) The 4G goes into the apartment: the easiest and fastest way is to activate the connection of your 4G mobile and connect it to your computer or tablet. BEDDING: all beds are very recent: 1 double bed 1m90 x1m40 in the bedroom, 2 bunk beds 1m90 x 90cm in the corner mountain, 1 sofa bed 1m90 x 1m40 quality in the living room. Cot umbrella present . ; Baby booster for the meal. The balcony is full SOUTH (see photo taken from the balcony!). Great view on the slopes. We are also listed on the owners of apartments, 874,715 reference (29m2 4 people) and 1,290,782 (22m2 2-4 persons) with the same finish and even serious follow if the period is already booked or are looking smaller. Arrival - Departure: Delivery of keys by a concierge service that will conduct an inventory on departure by appointment (the household must be done or else do plan ahead in the contract: 60 euros). Deposit 300 euros and will be returned by mail after the inventory. By check will not be cashed. For customers who do not have a check, the deposit will be paid at the same time as the balance and made by bank transfer (the correspondent on the spot does not accept deposit or cash balance !!). The apartment was great. Just as it is described and it looks in the photo's. We couldn't be any closer to the slopes and it is a simple, short walk into the village centre for the evenings. Location is away from any of the evening noise from bars etc. We were thinking about a return trip here even before we had left. The pick up of the keys and check out process were simple, the owners were helpful and easy to communicate with if needed. L'appartement est conforma a la description. Il est moderne, et ne manque de rien. La literie est confortable. Il est situé proche des pistes (mais pas skis aux pieds). I would definitely recommend it. Je le recommande. The appartment is as described. It was recently renovated, and has all the amenities. the beds are good. It is located near the slopes (not quite on the slopes though). I would definitely recommend it. What can we say other than what a fantastic apartment this is! We have stayed in a lot of self catering apartments in Val Thorens and this is by far the best. The view from the balcony is terrific although sadly was a bit too cold to use in January. The sitting area is very comfortable and the large kitchen has all you'll need for a proper self catering holiday. What sets this apartment against the competition is the space you get for your money. The bathroom is great with plenty of space and a brilliant powerful shower. The double bedroom is also very comfortable with enough space to move around the bed and has plenty of storage. We can't recommend this apartment highly enough and we're planning on returning again next season. Thanks to the owners too for being so helpful. Nous avons passé une semaine agréable à noël à 4 personnes. Ainsi que les propriétaires toujours joignable par mail et/ou téléphone. Ski: Departure and return ski in the foot.